West Shore is using Smore newsletters to spread the word online. For the second week in a row, I wanted to use my column this week to highlight some important and/or new events we have in store for the Upper School over the coming weeks. Please take some time to read over this information and put these events on your calendar. Friday, April 20, Upper School Day of Service: After eating some donuts in the Grove at 7:45 AM and taking attendance in their regular homerooms, the entire Upper School will be grouped and transported to various ministries in Central PA to assist them for the day. We will be returning in time for our regular dismissal time. We are asking for volunteers to transport students to and from their ministry destinations and chaperone students as they serve. Please email Jen Wempa if you are interested in transporting students and/or chaperoning. More information regarding service hours will be shared at our Academic Information Night (see below), but this school-wide event will fulfill student’s annual service hour requirement in its entirety. More specific information regarding the location your student has been assigned, what to wear, and whether to pack a lunch was shared with you via email late last week. 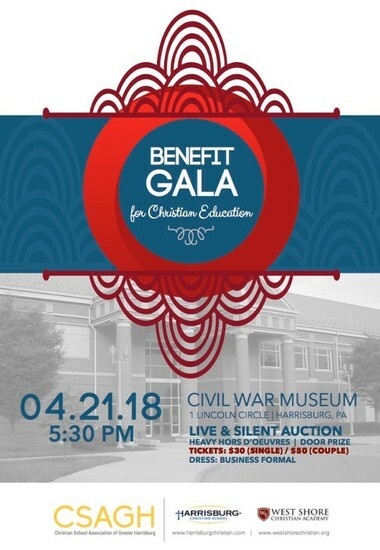 Saturday, April 21, Benefit Gala: I’m excited to see you at the Civil War Museum at 5:30 PM! Monday, April 23, Academic Information Night (Grades 5-7 at 5:30 PM; Grades 8-11 at 6:30 PM): With course selection time right around the corner (see below), we wanted to take some time to inform you of the exciting changes to our master schedule and course offerings for next year. A detailed power point presentation will be shared to outline the why’s, what’s, and how’s of the proposed CSAGH graduation requirements and upcoming course selection process. I’m aware that there are some away sporting events this night, so please know that the information covered in these meetings will be shared with those who are unable to attend. Wednesday, April 25-May 4, Course Selection Online: This year students will be using RenWeb to sign up for their classes next year. This process will be explained in detail at our Academic Information Night (see above). We are excited that RenWeb’s functionality allows us to streamline the course selection process. Congratulations, Adam Carvella (Carpentry), who was chosen “Student of the Quarter” at Cumberland Perry Area Vocational Technical School for the Third Marking Period. We are proud of your hard work, Adam! Congratulations to the following ribbon winners! 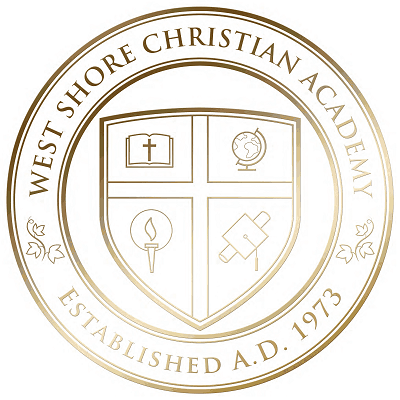 With the excitement of Junior/Senior fast-approaching, please remember WSCA's formal dress code guidelines. Boys must wear a dress coat, dress slacks, and a tie. Girls should wear modest formal dresses with no bare or sheer midriff. The back of the dress should not dip lower than the middle of the back and the front should not expose cleavage. If you are unsure of your dress suitability, please have the office check it either in-person or via photo. Any student or guest who does not meet dress code guidelines will not be permitted to attend. 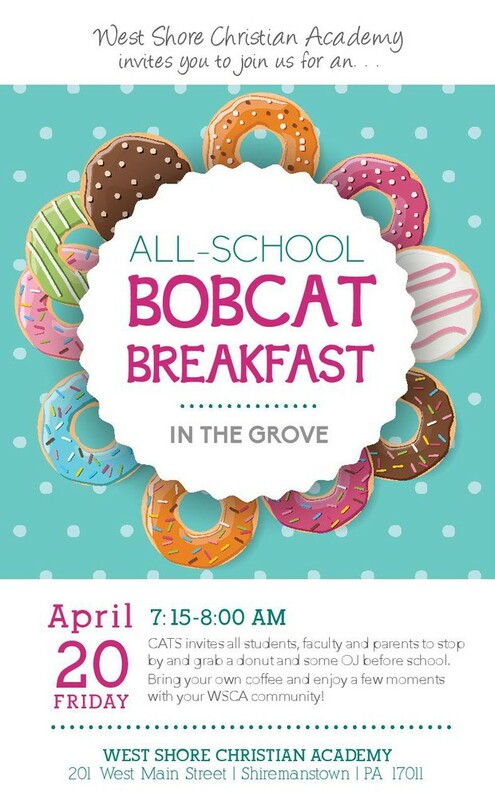 Friday April 20th in the Grove from 7:15 to 8:00, CATS invites all students, faculty and parents to stop by and grab a donut and some OJ before school. Bring your own coffee and enjoy a few moments with your WSCA community! We are getting very excited about the CSAGH Benefit Gala on April 21, 5:30-8:30! It will be a delightful evening with the goal of raising $90,000 for scholarships and student programs. You can still register for the event at https://bidr.co/events/gala2018. Please keep inviting your extended family and friends - this is a community event! All of the auctions items are available for live bidding (until Saturday morning) at https://bidr.co/events/gala2018/items. A separate email was sent out today with a sampling of items: Penn State tickets, vacation packages, Cirque de Soleil tickets, and so much more! Many of our teachers are offering items: bowling with Mrs. Cutting, soccer and ice cream with Mr. Kalnins, and a steak dinner with the Jekels. Our Lower School classes also donated baskets filled with spa, family game night, and beach items. We hope you will bid on these generous offerings! A full list of the auction items are attached below in two PDF documents. Thank you to everyone who donated items. WSCA's middle schooler, Anya Zvorsky, is a brain cancer survivor and is this year's "face" for the Race for Hope in Washington, DC. This year's race is on Sunday, May 6th. Find out how you can help by visiting www.curebraintumors.org and see the flyer attached to this newsletter! If you would like to post a flyer in your place of business, contact Jennifer Wempa in the upper school office. Please help us spread the word! Full descriptions are at www.westshorechristian.org. Applicants should send resume, letter of interest and application to our HR Department at jobs@csagh.org. With the high cost of college, scholarships are increasingly important. An updated PDF list will be attached to the bottom of the Upper School newsletter each week. Also, students can contact Mrs. Werner at any time for information or if they have questions. Due to difficulties in securing a venue reservation, the Junior-Senior Banquet has been re-scheduled. The Junior-Senior Banquet will take place on Saturday, April 28th from 6:00-9:00 p.m. at Strock Farms. Mark your calendars as the juniors start to plan a fun and memorable evening for our seniors. Tickets are on-sale now during high school lunch! Substitute Nurse & Teachers Needed! We are looking for a substitute nurse, who can help out once in a while when Mrs. Krouch and Mrs. Hoover cannot come to WSCA. We are also looking for additional substitute teachers, PreK-12th grade. Please fill out an application on our website and help us spread the word! The Upper School is in need of 10-12 forty quart clear plastic storage bins. We are continuing to clean up the attic and large bins would helpful. If you are willing to donate a bin, please bring it to the Upper School office. Thank you for your help! We have received five so far! Thank you! We are in need of a cafeteria cashier volunteer. 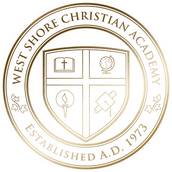 If you, or someone you know, is interested in ministering to our school and students in that way, please contact Sandy Berry at sberry@westshorechristian.org. Volunteer clearances will need to be completed prior to starting. If you need assistance registering for this year's SAT or ACT, please see Mrs. Werner in the guidance office. The next SAT date is May 5, 2018 and late registration is open until April 20th.